Most roads and railway lines have reopened after Storm Brian caused heavy disruption on Saturday. 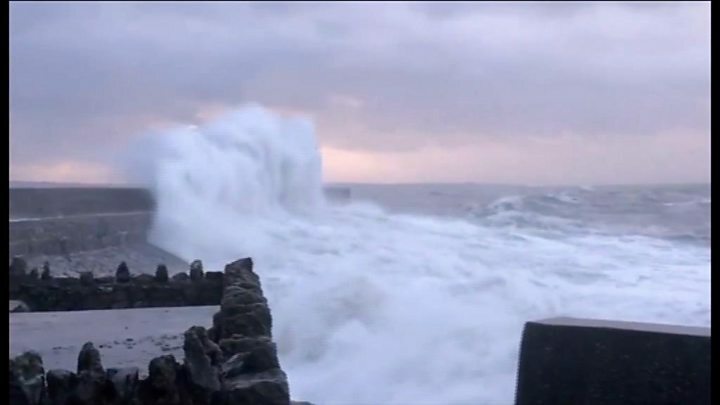 The strongest gusts on the UK mainland have been in Wales, with 78mph (125 km/h) winds recorded at Aberdaron, Gwynedd, and Capel Curig, Conwy county. Homes across south Wales lost power but electricity has since been restored. A flood warning for Trefriw, Conwy county, and a number of flood alerts have also been lifted. 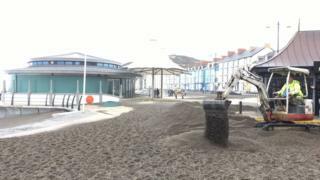 The road along the promenade in Aberystwyth, which was closed on Saturday, will remain shut on Sunday so that sand and shingle that was washed ashore can be cleared. Work to repair the sea wall in the Ceredigion town, which was slightly damaged, is due to start on Monday. Meanwhile, the M4's Briton Ferry Bridge in Neath Port Talbot and the M48 Severn Bridge in Monmouthshire have reopened after being closed for most of Saturday. But the Britannia Bridge between Anglesey and the mainland remains closed to high-sided vehicles, as does the A477 Cleddau Bridge in Pembrokeshire. Railway lines between Maesteg and Tondu, in Bridgend, and Porthmadog and Pwllheli, in Gwynedd, were both shut due to the adverse weather. A train struck a tree near Cross Keys, Caerphilly county, but no injuries were reported. The line between Cardiff and Ebbw Vale reopened on Saturday evening. National Rail is advising passengers not to travel along the Cambrian Coast line between Pwllheli or Aberystwyth and Shrewsbury. Dozens of Arriva Trains Wales services were also cancelled on Saturday and there are still widespread delays on the network as temporary speed restrictions are in place on the majority of railway routes. Natural Resources Wales (NRW) had warned that the coastline was likely to be "extremely dangerous this weekend" and urged people to avoid it. At one point, more than 1,700 homes were left without power - with Newport, Pembrokeshire and Caerphilly the worst affected areas. Electricity has since been restored to all properties.